Pyramax®, a fixed-dose combination of pyronaridine and artesunate co-developed by MMV and Shin Poong Pharmaceutical Co. Ltd., South Korea, is the newest ACT combination to be approved by a Stringent Regulatory Authority. It is the only ACT to be granted a positive scientific opinion under the European Medicines Agency’s (EMA) Article 58 procedure, and is the only ACT to be specifically indicated for the blood-stage treatment of both of the two main strains of malaria: P. falciparum and P. vivax. WHO currently recommends artesunate-pyronaridine in areas where other ACTs are failing.1 Pyramax is also the first Korean product included in WHO’s list of prequalified medicines for malaria and was added to the WHO’s Model List of Essential Medicines (EML) and Model List of Essential Medicines for Children (EMLc) in 2017. This once-daily, 3-day therapy is indicated for the treatment of uncomplicated malaria in adults and children over 20kg (Pyramax tablets) and in children and infants between 5 and 20 kg (Pyramax granules). After a restricted label was granted in 2012, via the EMA Article 58 positive opinion – due mainly to the lack of “real life” data on safety following repeat dosing - Pyramax was assessed in a phase IIIb/IV safety and efficacy study in West Africa (WANECAM) over 4 years. The interim analysis of this study, published in 2016 in Lancet Infectious Diseases 2, evaluated the safety and efficacy of Pyramax when administered to patients in the study each time they suffered repeated bouts of malaria over their 2-year follow-up period. The results of the interim analysis, since confirmed by the final results of the study, published in 2018 in the Lancet 3 indicated that the safety profile of Pyramax is similar following re-treatment to that seen with initial treatment. This positive data was instrumental in informing the EMA’s decision to grant a revised label for Pyramax tablets in 2015, removing restrictions on repeat dosing, on use only in areas of high resistance and low transmission, and on requirements for liver-function monitoring. In addition, a positive scientific opinion was granted for Pyramax granules, a child-friendly paediatric formulation. Today, both Pyramax tablet and granule presentations are cross-referenced on the WHO’s list of prequalified medicines, enabling them to be purchased with donor funds. 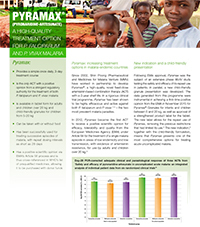 A large Phase IV real-life study is currently underway in five African countries to evaluate the safety of Pyramax when used in community settings. The CANTAM study is projected to complete recruitment in the first half of 2019 and will include over 8,500 malaria episodes. As of January 2019, 7,363 patients have already been treated with Pyramax in community settings in this study. In addition, in 2018 a study to evaluate the use of Pyramax in asymptomatic carriers was initiated in The Gambia and Zambia. This study will provide important data to the malaria community - both healthcare providers and policy makers - to inform global efforts to reduce the burden, and ultimately to eradicate malaria. It will focus on a population of individuals - currently not well understood - who are infected with P. falciparum parasites, but who display none of the symptoms associated with this serious and debilitating disease. Since these individuals do not have symptoms they rarely seek treatment, but being infected they can still transmit the infection if bitten by a mosquito. The study will assess the efficacy of Pyramax administered for 3 days, 2 days or 1 day in clearing a P. falciparum infection in asymptomatic carriers, and is expected to be completed in 2019. This interactive map shows the countries where Pyramax is registered. This interactive map shows the countries where Pyramax granules is registered. MMV has worked closely with Shin Poong to facilitate the correct use of Pyramax. Specifically, packaging and dosing instructions were field tested in Kenya, India, and Senegal to ensure acceptability, relevance, and comprehension with caregivers, patients and healthcare workers. MMV is supporting Shin Poong in facilitating the registration of both tablets and granules at country level, and in educating national policymakers and stakeholders about the appropriate use of this medicine at a country level. This includes regional technical briefings in East and West Africa for country-level stakeholders, which took place in August 2017. Academy of Education Development (AED), Central Africa Network for Tuberculosis, AIDS/HIV and Malaria for the conduct of clinical trials (CANTAM), Division of Malaria Control Kenya, National Institute of Malaria Research India (NIMR), Programme National de Lutte contre le Paludisme Senegal, Shin Poong, West African Network for Clinical Trials of Antimalarial Drugs (WANECAM) partnership. 1. World Health Organization Q&A on artemisinin resistance. 2. Sagara I et al, Safety and efficacy of re-treatments with pyronaridine-artesunate in African patients with malaria: a substudy of the WANECAM randomised trial. The Lancet Infectious Diseases, Volume 16, Issue 2, 189–198. doi:10.1016/S1473-3099(15)00318-7. 3. The West African Network for Clinical Trials of Antimalarial Drugs (WANECAM),Pyronaridine–artesunate or dihydroartemisinin–piperaquine versus current first-line therapies for repeated treatment of uncomplicated malaria: a randomised, multicentre, open-label, longitudinal, controlled, phase 3b/4 trial, The Lancet 2018 Apr 7;391(10128):1378-90.